At 1.2%, UK retail sales grew at the fastest monthly pace since April as Black Friday saw another surge in sales of household and electrical goods. As is often the case though, it's worth treating these numbers with some caution. Black Friday is a relatively new and ever-changing beast, which makes it a nightmare for statisticians to seasonally adjust. The British Retail Consortium and Visa have both suggested that this year's event wasn't quite the usual bonanza, as consumers continue to cut back on non-essentials. 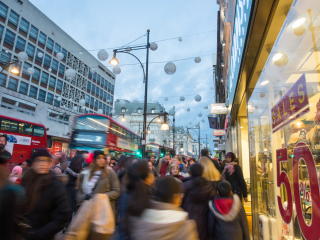 But even if this month's retail sales figures are accurate, it's fairly likely that there will be a reversal in December as many consumers simply do their Christmas shopping earlier to benefit from the discounts. Temporary fluctuations aside, there are few reasons to expect consumer spending to improve as we head into 2018. True, the bulk of the pound's tumble has now passed through to prices, but for the time being real wages remain stagnant. Consumer confidence is still as low as it was in the immediate aftermath of the Brexit vote, and with early signs the jobs market is going through a rough patch, shoppers are likely to remain wary. This all means the economy could struggle to regain momentum through next year. This gives the Bank of England a conundrum. The increased likelihood of a swift transition deal agreement in the first quarter could see some investment return - although there are still some big Brexit questions looming in 2018. That might see the Bank strike a cautiously optimistic tone today - although they are unlikely to give any clear signals on the timings of a possible hike. However, with the economy struggling, we still stress that a rate rise next year is not a done deal.